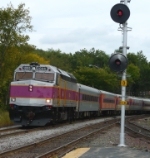 Album Info: Shots of the Massachusetts Bay Transportation Authority commuter rail trains. Description: Vintage MBTA FP10 #1109 at Lowell MA. Photo by Bill Briggs. Description: MBTA work train led by engine 902 at Ayer MA... note the caboose! 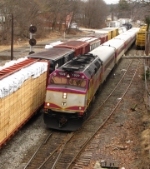 Description: Outhbound MBTA commuter train leaves Shirley MA on the way to the end of the line at Fitchburg MA. Description: MBTA commuter engine 1050 by the Ayer MA stop. Description: MBTA work engine #3247 idles at Shirley station. Description: Inbound MBTA commuter lead by F40PH #1012 at Shirley MA. Description: This MBTA commuter train is at Shirley MA on the old B&M Fitchburg line. Description: This particular MBTA commuter train had the unusual task of helping with the brake set-release of Guilford/PanAms train EDNM! This was made possible by a freight that was stalled before the Fitchburg station. The commuter train had to switch tracks in order to get by further down the line. Description: Outbound MBTA commuter train prepares to stop at Belmont. Description: Inbound MBTA commuter train approaches Belmont Center. Description: Inbound MBTA commuter train at Ayer MA. The intermodal at right is PanAm train MOAY. Description: Outbound MBTA commuter train at Ayer MA. Description: Inbound MBTA train heads to Boston. Description: MBTA commuter train heads towards Boston on the Fitchburg line. Description: Inbound MBTA commuter train leaves Ayer station. 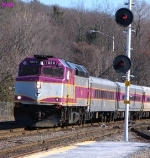 Description: Inbound MBTA commuter train leaves Lowell. Description: An MBTA work train has dumped rail down the line at Shirley and is waiting to head back east toward Boston. Description: Inbound MBTA commuter train passes PanAm intermodal MOAY. Description: MBTA #1051 leads an outbound commuter train through Ayer MA in the rain. Description: Inbound MBTA commuter train arrives at Ayer. The NS power at left is for the day's Pan Am Southern intermodal train AYMO. Description: Inbound MBTA Commuter Train stops at the Shirley station.